HomedigestAre bots taking over Wikipedia? Are bots taking over Wikipedia? As crowdsourced Wikipedia has grown too large — with more than 30 million articles in 287 languages — to be entirely edited and managed by volunteers, 12 Wikipedia bots have emerged to pick up the slack. The bots use Wikidata — a free knowledge base that can be read and edited by both humans and bots — to exchange information between entries and between the 287 languages. 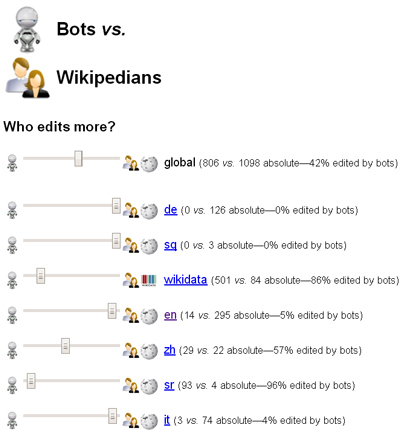 Which raises an interesting question: what portion of Wikipedia edits are generated by humans versus bots? To find out (and keep track of other bot activity), Thomas Steiner of Google Germany has created an open-source application (and API): Wikipedia and Wikidata Realtime Edit Stats, described in an arXiv paper. The percentages also vary by language. Only 5% of English edits were by bots; but for Serbian pages, in which few Wikipedians apparently participate, 96% of edits were by bots. 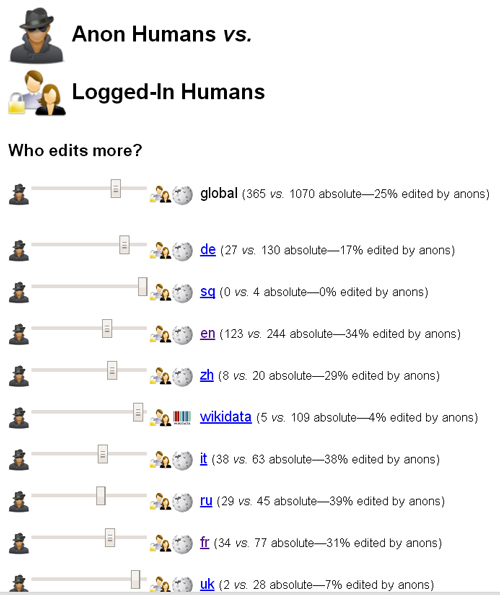 The application also tracks what percentage of edits are by anonymous users. Globally, it was 25 percent in our snapshot and a surprising 34 percent for English — raising interesting questions about corporate and other interests covertly manipulating Wikipedia information.